In his pre-budget report yesterday, Chancellor Alastair Darling has said that the government will levy a £6 a year tax on all phones lines in Britain. The money raised will be used to extend the current broadband network and find the next generation super-fast broadband network. The contentious tax was first proposed in the Digital Britain report, which appeared in June, and the Chancellor confirmed yesterday that he's taking up the measure. "We now want to go further, so we can provide the next generation of super-fast broadband to 90% of the population by the end of 2017," explained Darling. "This will be funded through a duty of 50 pence a month on landlines which will be included in the finance bill." Although BT is committed to sinking £1.5 billion to cover 10 million homes with fibre optic cable by 2012 and Virgin already has a fast cable network that spreads across more than half UK households, neither company has been eager to invest more in super-fast broadband. 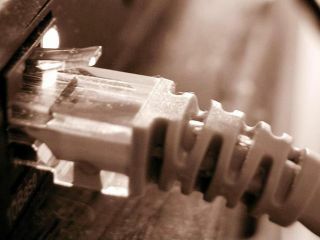 The £175 million a year raised by the tax will be available to firms willing to create super-fast networks in rural areas. However, in return they'll have to make that network available to all ISPs. According to leaked HMRC data, 1.7 million households possess more than one phone line, and they'll be required to fork out the extra 50p a month on each line they own. To add insult to injury, VAT will be tacked on to the tax. The Chancellor failed to adopt another Digital Britain proposal that would have given a tax breaks to British games developers.